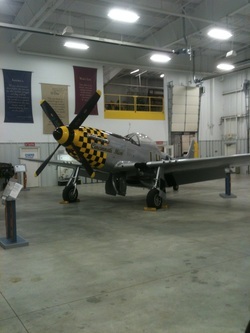 This week I was offered a great opportunity to visit Cincinnatti for work and took the time one evening to visit a neat warbird collection there. It's a relatively small museum with half a dozen planes or so, but they are all top notch examples of classic WW2 fighter and bomber aircraft, including my favourite, the P-51 Mustang. I remember watching a movie years ago I think called Emporer of the Sun in which during the liberation of a Japanese concentration camp, a P-51 buzzes the prisoners and a young boy, well-versed in American warplanes cheerfully shouts "P-51 Mustang, Cadillac of the Skies!" knowing that freedom is at hand. Chuck Yeager also recounts some great P-51 stories in his autobiography about coming back from barnstorming with treetop leaves stuck on the plane. 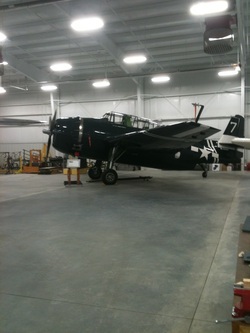 The plane just oozes cool and once again,I'd give my right hand to ride in one. The first thing any museum curator will point out to you about the Avenger (if you happen across one in an American museum) is that this was the model George Bush senior used to fly. 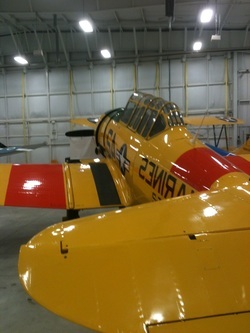 A nice airworthy Texan trainer. 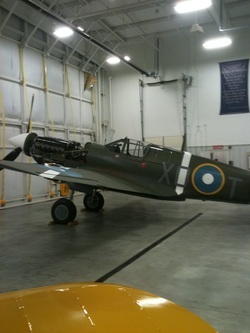 Originally a Canadian registered warbird.